What was once a farmer’s field became a world class motorsports facility. 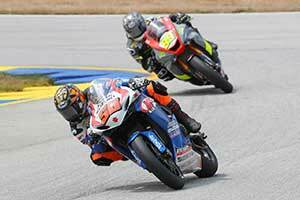 Another track’s loss due to flood damage was Michelin Raceway Road Atlanta’s gain when a Cam-Am series race had to find a new home in a hurry. Michelin Raceway Road Atlanta literally took form in a six-month rush to excavate, grade and pave a 12-turn, 2.5-mile road course. On September 13, 1970, Vic Elford sat on the pole for the first Michelin Raceway Road Atlanta race. 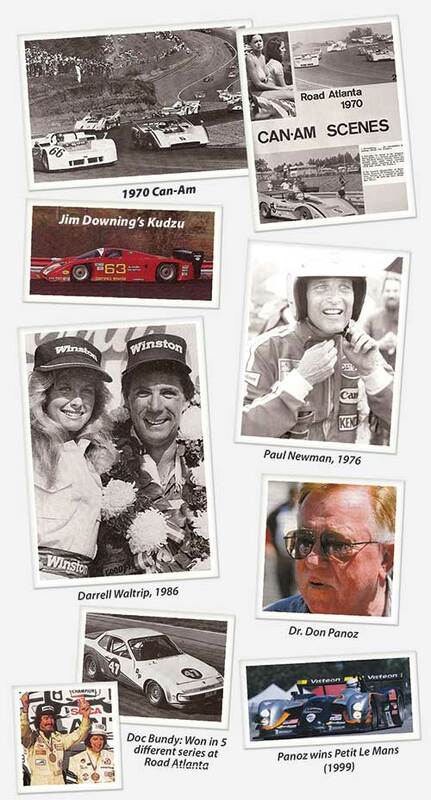 The best drivers were competing: Denis Hulme, Peter Revson and race winner Tony Dean. Stirling Moss was the Grand Marshal. A huge crowd gathered to watch the most sophisticated cars of the day turn 75 laps on the brand new circuit. The 1970’s brought faster, more sophisticated cars and better talent in series like the Can-Am, Formula 5000, IMSA Camel GT and Trans Am. Among the drivers who traversed the challenging track were Jody Scheckter, Dan Gurney, Peter Gregg, Mario Andretti, Keke Rosberg, Bobby Rahal, Paul Newman and Mark Donohue. It was a great time for road racing and for Michelin Raceway Road Atlanta. Michelin Raceway Road Atlanta was sold in 1978 and went through a number of owners in a short period of time, creating a downward spiral of the track’s fortunes that ultimately resulted in bankruptcy in 1993 when a partnership between business executives Frank Drendel, Jim Kanely, Eddie Edwards and Bill Waddell was formed to purchase the track. The next three years were spent making gradual improvements to a facility that had not enjoyed the kind of care it deserved for at least a decade. New buildings were constructed, others were renovated, the track was widened and resurfaced and the grounds were landscaped. But the owners lacked the kind of capital that could return Michelin Raceway Road Atlanta to its glory days. Enter Dr. Don Panoz. The developer of the nicotine patch and founder of neighboring Chateau Elan Winery and Resort, Panoz got into the automotive field when his son Danny began producing the Panoz Roadster. The elder Panoz realized what great potential Michelin Raceway Road Atlanta possessed and bought the facility in November 1996. 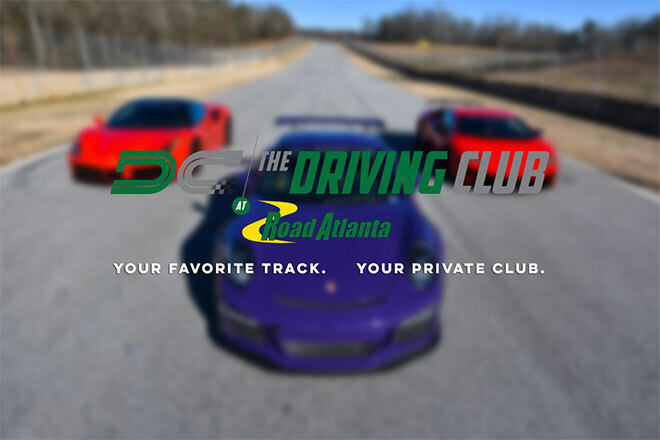 Dr. Panoz’ varied business interests – including the Panoz Motor Sports Group and the world renowned American Le Mans Series – are based in Braselton. The second phase of improvements involved the construction of the new Infield Paddock and pits, located in the Infield between Turn 12 and Turn 1. With two paddocks, Michelin Raceway Road Atlanta is able to accommodate more teams and the availability of two pit complexes allows for easier transitions between races. A new hospitality shelf overlooking the Infield Paddock was also built. Michelin Raceway Road Atlanta has not only been made more convenient and safe for teams, it is also a fan-friendly, family-orientated destination – Kids 12 & Under Are Always Free! New restrooms and showers, and the 10,000-seat Terrace Seating complex at Turn 10 added to fan comfort and convenience. Michelin Raceway Road Atlanta is situated on 750 acres in Hall County. The facility contains 300,000 square feet of paved paddock, a 250-foot skid pad and 80,000 square feet of paddock space. Hospitality Suites and Chalets are available during the major events for corporate entertainment.